Unless security forces have torn it down, the poster (shown here) was one of the sights President Obama would see if his motorcade made its way to Ramallah, Palestine on a West Bank highway. The poster was posted on a corner after the road passes through the Qalandia checkpoint separating the West Bank from east Jerusalem. The poster would be one of more hospitable messages a disappointed Palestinian public would offer the visiting President on his visit to the West Bank this week. Mahir Alawneh, a young Palestinian web consultant, designed, and placed a poster along the President’s route. Alawneh told the Al Monitor web site he wanted to send a more gentle message to the American visitor. It is well known that President Obama makes extensive use of his personal computer. The loss of a 3G connection should register on the President as a deprivation, albeit, one of the lesser items Israel withholds from the Palestinian population. The largest Palestinian deprivation, of course, is the absence of freedom for a people living under occupation, an issue the President was not expected to address in any of his public utterances this week. 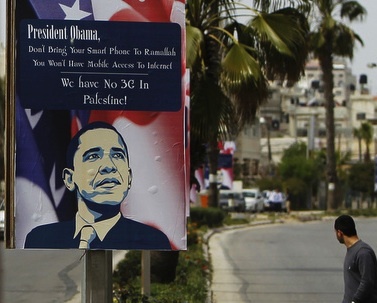 The banner with Obama’s picture is among many hung by activists, seeking to raise the American president’s awareness of the lack of 3G frequencies in the West Bank. President Obama’s Middle East trip suggests nothing less than a man on a “hand-holding exercise” for Israelis, as one observer described the visit. It was also a journey that showed little concern or respect for a Palestinian people suffering under a military occupation which controls their every move, including their access to 3G. If there is the slightest humane or moral value in this hand-holding exercise, it is hidden from the view of mere mortals. Behind this trip is a purely Zionist political agenda. The trip is nothing less than a blatant political effort to persuade Israelis, especially young adults, that Barack Obama wants to be their friend. Jonathan Cook, writing in CounterPunch, explains one political reason why restarting the peace process is not on Obama’s agenda this week. As [Prime Minister Benjamin] Netanyahu forms a new cabinet in his third term as prime minister, he has less control than he had in his previous governments. The settlers’ dedicated party, Jewish Home, has been awarded three key ministries – trade and industry, Jerusalem, and housing – as well as control of the parliamentary finance committee. The new political control exercised by settlement leaders and their supporters, will ensure, Cook writes, that the settlements will flourish during this government’s term, not a recipe for peace with the Palestinians. Which brings us to a work of popular film art that has the potential to throw some small amount of light, and perhaps a dollop of wisdom, on this complex problem. As Obama prepares to return home, we might pause a moment to revisit the classic film, Blues Brothers, a 1980 picture directed by John Landis, which just happens to be set in Obama’s hometown of Chicago, Illinois. The film opens with one brother, Jake, leaving prison. He and his brother Elwood, are reunited around their determination to save the Chicago parish orphanage where they lived as children. They learn from the Mother Superior (still at the orphanage, and still wielding a ruler) that their old home will have to close unless the Mother Superior can come up with $5000. Jake is John Belushi, right, in the picture shown below. Elwood is Dan Aykroyd, at left. 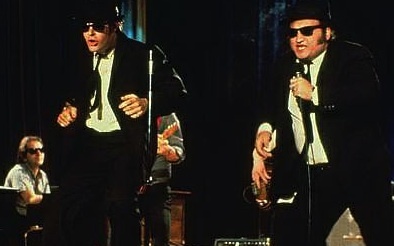 They are the Blues brothers. Their mission from God is to save the orphanage. The obstacles they face appear to be as insurmountable as the obstacles facing President Obama as he makes his first trip as president to Israel and Palestine. First, he will put the US-Israel band “back together”. Can he do that without alienating the Palestinians, the other party to this intractable problem? He will try, starting with his careful words following a two hour Thursday meeting with Palestinian President Mahmoud Abbas. U.S. President Barack Obama said on Thursday that settlement building in the West Bank did not “advance the cause of peace,” but stopped short of demanding a construction freeze to enable negotiations to resume. Speaking at a joint news conference with Palestinian President Mahmoud Abbas, Obama said he remained committed to the creation of an “independent, viable and contiguous” Palestinian state alongside a secure Jewish State of Israel, but said achieving that goal would not be easy. “The core issue right now is how do we get sovereignty for the Palestinian people and security for Israeli people,” he told reporters following almost two hours of talks with Abbas. A delicate balancing act, to be sure, but the speech does not erase the reality of this trip’s Israeli-focused schedule.On this trip Obama focused exclusively—with brief token stops in between—on Israel’s narrative. He visitedd the Dead Sea Scrolls, an artifact discovered in the West Bank, which Israel has moved to a museum in Israel to symbolize its “historic homeland”. Obama will also lay wreaths at the tombs of major Israeli leaders. He spoke to college students, an audience that should be more receptive to his personal style and message, more receptive, that is, than established politicians in the Israeli Knesset. In his effort to win the hearts and minds of Israel’s publics, and thus to shape future political decisions, Obama is burdened by his own set of obstacles, an implacable Zionist-purchased US Congress, a propagandized American public, and a newly-elected settler-dominated Israeli government. President Obama also receives little support from a highly agitated progressive base now starting to think of him as Bush II. With friends like these, the impossible becomes even more difficult. Cook County Assessor’s Office Clerk: Can I help you? Jake: This is where they pay the taxes, right? Cook County Assessor’s Office Clerk: Right. Elwood: This money is for the year’s assessment of Saint Helen of the Blessed Shroud Orphanage in Calumet City, Illinois. They earned the money honestly, signing a contract with a record promoter, achieving their impossible dream. And, as they saw it, succeeding on their “mission from God”. Will Obama accomplish his goal of peace between Israel and Palestine? Will he be able to persuade an Israeli public (especially the younger citizens) that a war with Iran would be national suicide? And what chance does he have that the Palestinian public will understand that his one-sided trip schedule is finally in the best interest of peace? On both counts, success seems not just evasive, but impossible. To Obama’s credit, he is trying. Maybe he feels he, too, is on a “mission from God”. And just maybe, he is right. As we await the final hours and aftermath of Obama’s trip, there is a rousing song from the Blues Brothers film, that offers a simple, yet profound non political solution to a complex problem. During the excitement of the concert where they perform, the brothers escape the clutches of the Illinois state police, and make their way to the Cook County’s Assessor Office Clerk with a $5000 check, thus demonstrating the marriage of hope with pragmatism. This entry was posted in Middle East, Middle East Politics, Movies, Netanyahu, Obama. Bookmark the permalink. Thank you for a sobering article for those of us who have any illusions about justice and peace. It is obvious that the Israeli tail does NOT wag the dog, as we all thought. The Israeli “tail” has metamorphed to become THE DOG, itself, which has transformed further into a demon-wolf. The Israelis have embarked recently on a new strategy:To look the world in the face and say, with its Trade-Mark X-treme Chutzpah, that there is NO “Palestinian” question, or problem, or issue. The Israelis will insist that they only have one issue: “Iran”. Syria and Hezbollah are derived from the primary Iranian issue. Their objective is to try to snuff out any Palestinian hope for freedom and independence and a state of their own. The Q&A of the Press Conference (March 20, 2013) was obviously staged by its organizers to ask questions about the alleged use of chemical weapons in Syria. Anything to avoid any mention of “Palestine”. And Netanyahu kept repeating his interpretation of what Obama promised in aid for Israel for the next 10 years. Considering that only 2 questions from Israeli and US journalists were permitted, guaranteed exclusion of the primary topic. Israel is assuring the Palestinians that non-violent resistance does not pay. It only guarantees that there will be more illegal settlements, alien “American-Russian” settlers, and more ethnic cleansing in Palestine. Jim: What an excellent analogy. Do you think that if President Obama did not see or realize the big things, he will see the smaller things; that an Apartheid Wall is bigger than a 3G? Of course not. dollars, at the welcoming gateway. One wonders if he is holding on to his Nobel Peace Prize to use it as a torch to succeed in winning back the confidence of Bibi Natin. As for the Palestinians they have already given up on the good will of the US, not only by this President, but previous ones who , in the name of winning elections, succumbed to the Zionist demands. They don’t really work for peace around the world, or try to fix the economy at home where many Americans are going to sleep hungry or are homeless, or have no job, or subsidized health care. The number of those decent, innocent, loyal Americans exceeds the population of “Israel”. President Obama is planting a tree that the media is flashing the news that it might be uprooted? President Mahmoud Abbas should challenge President Obama by giving him a tour of the groves of olive trees uprooted by the settlers. President Obama should be taken by land routes to visit Bethlehem, not to visit the confiscated scrolls of the Dead Sea. President Obama’s good intentions for peace and justice for the Palestinians should not be deterred by pressure, but by conviction, so he will go down in history as a real Peace Prize winner. Also, he should know, that, as for the Zionists, if everyone on this planet converted to Judiasm, and ate nothing but kosher food, and prayed by the wailing wall, Zionists will not acknowledge them as equals to them. Racism is embedded in their minds since the times of the prophets. Jim, I think your sober realism is important, but I fear you give Obama too much credit. I hope you may be right.